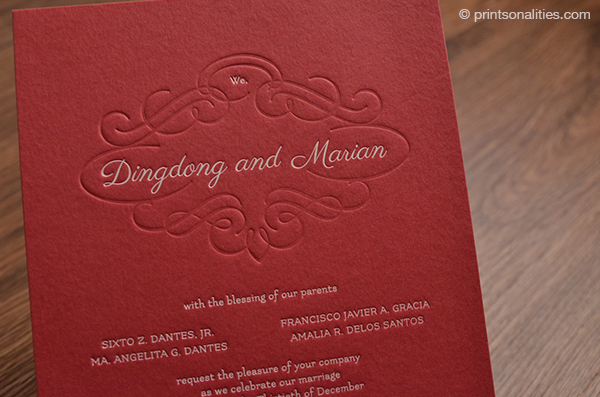 The wedding invitation of Dingdong and Marian is truly a combination of their personalities—of Dong’s edginess and Marian’s femininity. 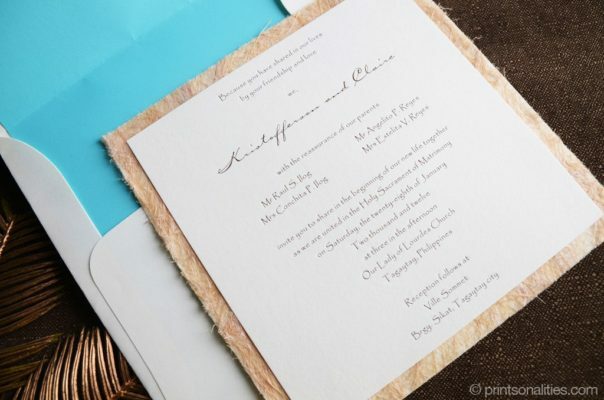 In this post, we will be treating you to official photos of the invitation that will surely delight your eyes and satisfy your curiosity for the invitation to this this much-anticipated wedding. It is a phenomenal marriage of a great love story, quality workmanship, attention to detail, premium paper, and passion for our craft. 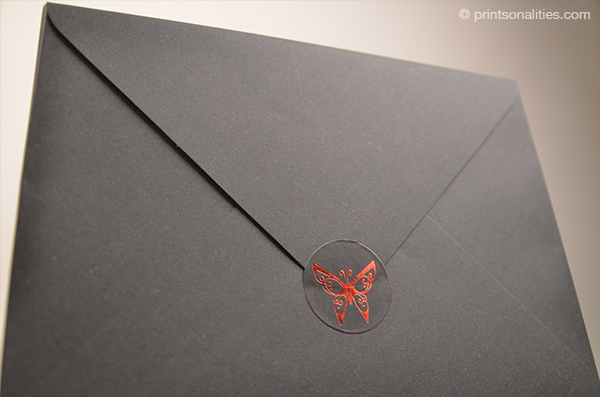 Taking the invitation out of the envelope is a treat for the senses in itself. 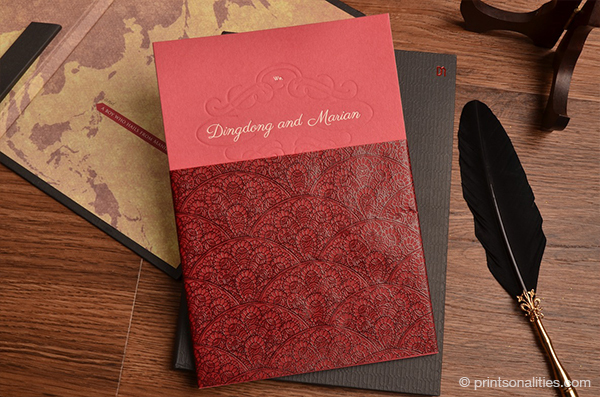 Your hands will want to feel the pattern (Read: The Dongyan Diaries – The Logo is in the Pattern) delicately embossed onto Italian paper that has the texture of a bespoke suit and your eyes will be mesmerized by the logo in red foil. 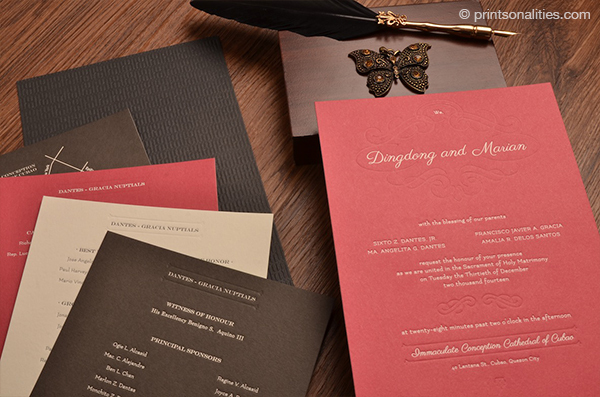 Something worth noting is that the hardbound execution of the invitation evokes the feeling of a storybook, and aptly so because of the invitation’s focus on their love story. As you spread out the panels you are greeted by a sampling of everything that’s in store for you. Not not too much though for it leaves enough mystery for you to want to know more. 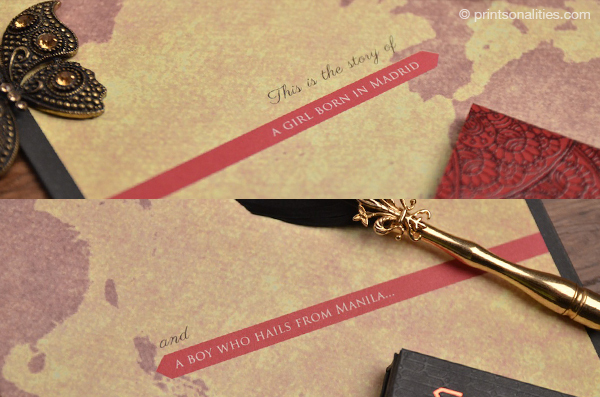 The invite starts to reveal the narrative with the first few lines of a poem and with the invitation cards tucked away in an exquisite faux-lace wrap with a Spanish inspired pattern. As you pull out the cards from the pocket adorned with their monogram, the rest of the poem is revealed. You see a vintage world map–with arrows pointing to Madrid and Manila, the starting point of the couple’s journey–enough to pique your interest and carry you forward to explore the invite. Taking out the cards from the wrap, you count 6 of them in alternating colors of red, black and white. An ingenious way we devised to break the monotony of black in order to soften it for the eyes. 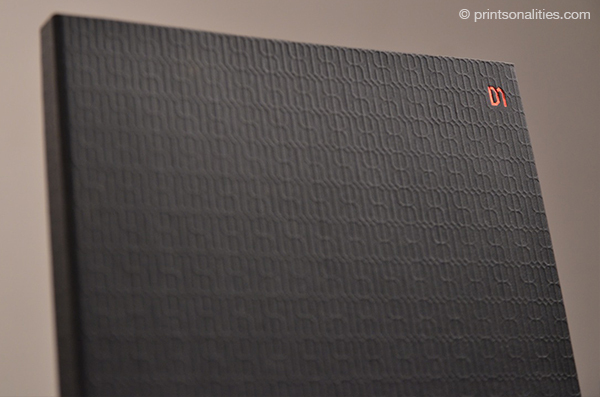 All the cards are backed with the pattern found on the front of the folder for a unified look. Even the cards are a tactile experience, they went for the best and chose letterpress. While going through the details with your eyes, your hands will surely be exploring the impressions on luscious cotton paper. Another interesting feature of this invite is the donation card that asks to donate to a good cause in lieu of gifts. Their beneficiary is YesPinoy, an organization Dingdong founded that is engaged in activities to empower the youth. 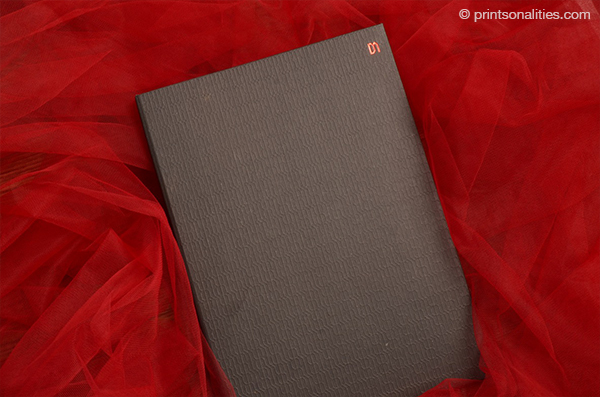 The envelope was made from the same premium Italian paper the hardbound cover was made of. It was addressed in hand calligraphy using silver ink. 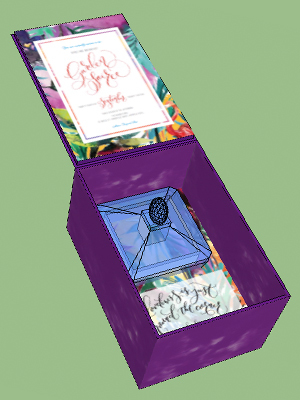 The entire invite is sealed by a sticker that features a butterfly, referencing where this journey all began: the proposal in a butterfly dome. 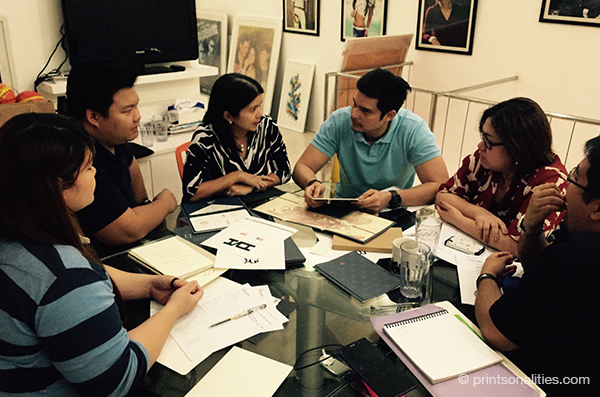 When we got the call that we would be doing the Principal Sponsor invites of Dong and Marian and that they wanted something special, we were beside ourselves because we love things that challenge our creativity. 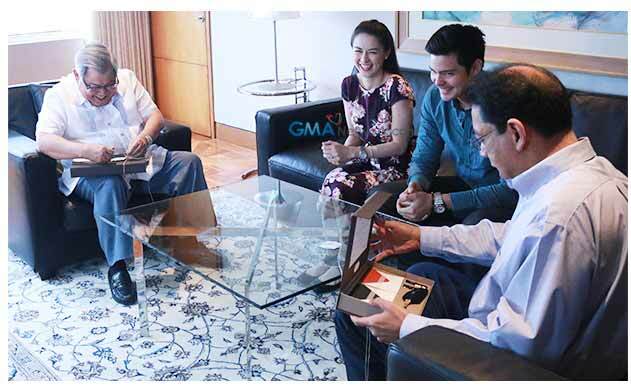 The people they listed were those who have made a notable impact in their lives—people who have guided them in some way and they wanted that guidance to be with them as they start a new chapter in their lives. It was important for them to be the one to personally invite the people they wanted to be their principal sponsors and not just call them up or have someone else ask for them. They wanted to emphasize how important these people were to them so they put a lot of thought into what token to give them. 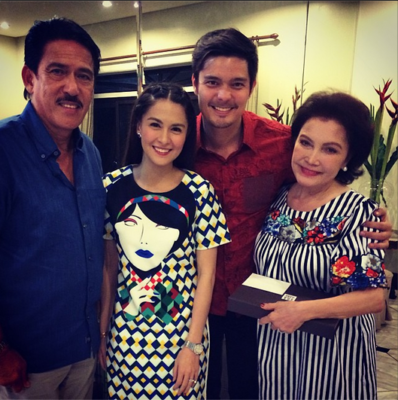 It had to be usable, meaningful and reflective of the big part they played in the lives of Dong and Marian. 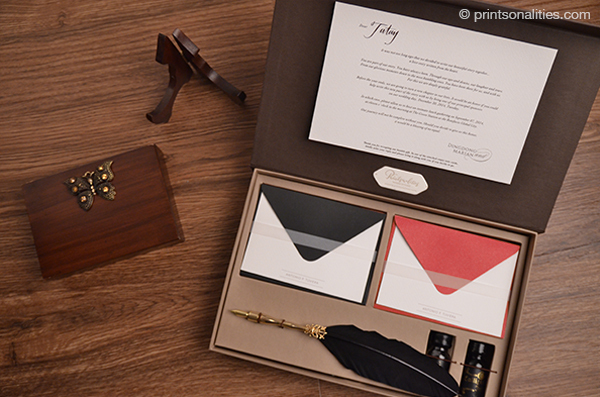 There were quite a few concepts but we finally went with the dipping pen quill and ink set envisioned by their wedding planner Teena Baretto. 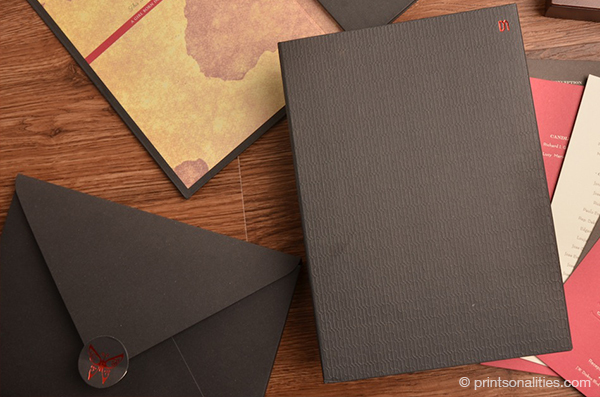 They gave a premium Printsonalities Paperie box from our Paperie Classic line that allowed them to customize the contents of the box. 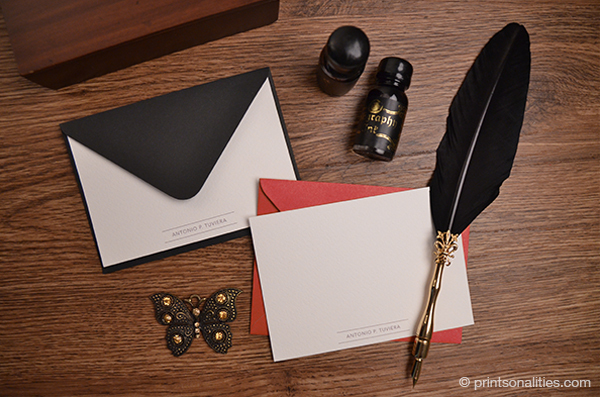 Inside, we assembled a dipping pen quill, two bottles of ink and personalized notecards lovingly made by us. 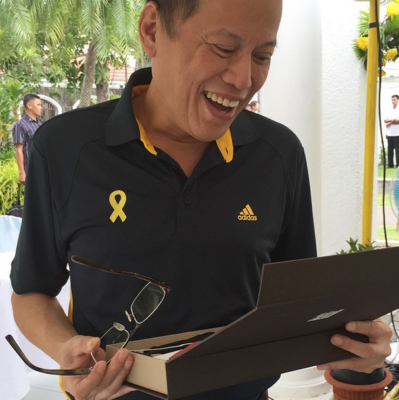 When we first met about the invitation, Dong shared that he wanted their logo to be a combination of the letters D and M but in a way that was not too obvious. Although they already had an event monogram, for the first presentation of drafts, we worked on some concepts for creating a “brand” to be applied to their invite. The theme for the wedding: Filipino – Spanish. The chosen study was the logo we created that when repeated into a pattern is evocative of Spanish tile work. We were happy to be able to subtly incorporate the theme into something that wasn’t overly ornate and girly as easily becomes the case in the world of weddings. Every girl wants to be on the cover of their favorite magazine. For your special day, we say: go for it! 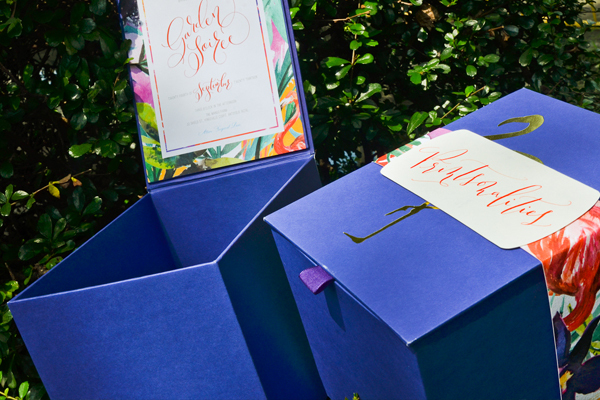 If it’s true that first impressions last, then, The Serranilla sisters certainly gave the best impressions with their unique debut invitations. Both Zian and Lian are achievers and passionate individuals and through their birthday celebrations, they gave the world a taste of what they bring to the table. 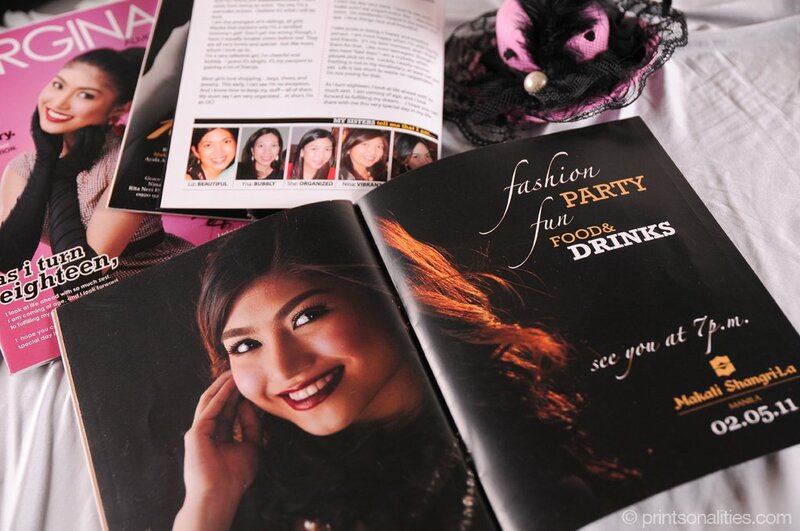 Fulfilling this dream, Zian Serranilla was on the cover of her own magazine debut invitation! It features every bit of her personality and lifestyle–her appreciation for fashion, her favorite things, her loving family and everything that means anything to her. It perfectly suits someone like Zian who’s bursting with so much energy and so much youth. The whole magazine invitation stays true to Zian’s theme with a vintage glam design highlighting the stunning photos of the debutant in 50s fashion. A year later, another Serranilla princess turned 18 and we couldn’t have been happier to make another girl’s dream come true with an out of the box debut invitation. She wanted a similar concept but wanting something uniquely her. 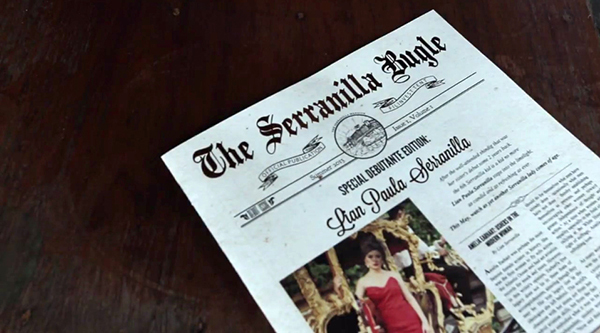 So, Lian Serranilla, graced the front page of the “Serranilla Bugle”, her newsletter debut invitation. If these publications hit the stands they would have given everyone a run for their money! For special invites like these, there’s so much room for creativity! But it can be a little overwhelming to think about the content to fill in the pages, a theme, knowing where to put what and what etc. Organization and planning goes a long way, but when everything falls into place, a magazine invite is a treasure you’ll carry throughout your life. 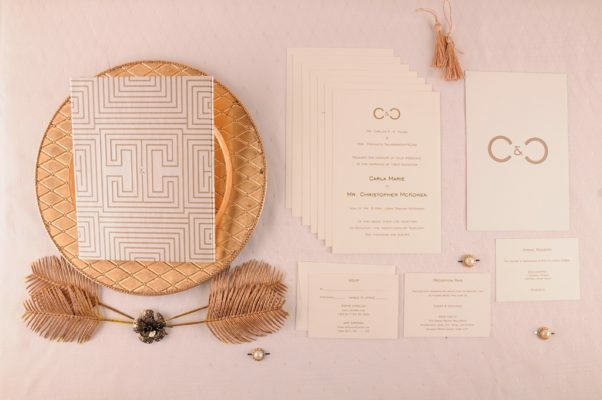 The Garden Soiree invite was definitely a statement piece with a strong yet dainty personality. After the first box was assembled, we were ecstatic about how lovely it turned out to be. 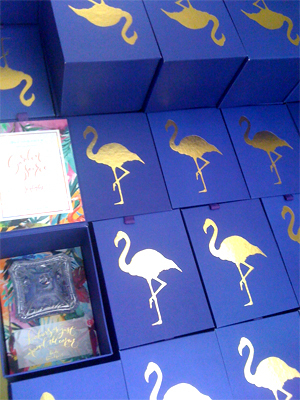 The lovely design, rich purple custom-colored box, brilliant gold foil had us in a daze. 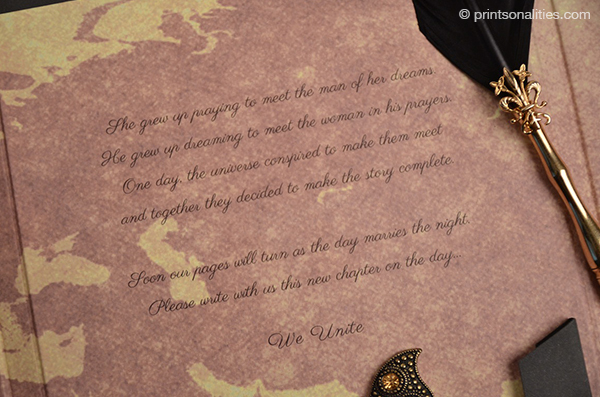 The first guideline for the invitation was it had to impress; opening it should be an experience. When Janna Simpao, the woman behind brideandbreakfast.ph, decided on a concept she sought out the suppliers that she was confident could not only deliver but wow her guests as well. 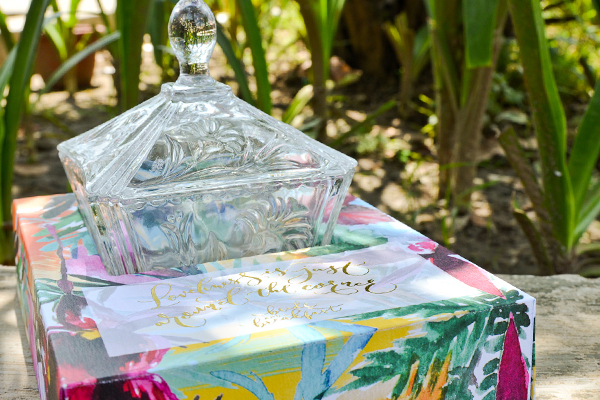 Arlene Sy-Salva hand painted the tropical flora in watercolor, The Fozzy Book did the design for the cards and all the beautiful calligraphy while Printsonalities was tasked with bringing these designs to life in print and expertly putting together the delightful package. Contrary to popular belief, invitation making is highly technical. There are a lot of specifications to get right and the smallest details can make or break a suite. Getting the size perfect so cards don’t move around, readying digital artwork for printing, actual printing and color matching, assembly and ensuring that etiquette standards are met, are just some of them. 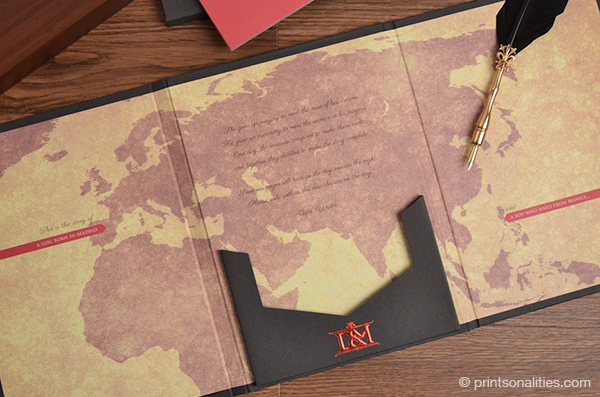 For this invitation, we made a 3D mock-up before production. 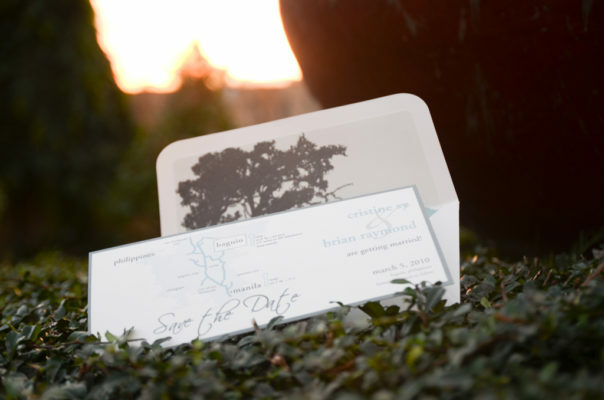 Upon arriving at the venue, we were thrilled that the invitation served it’s purpose well. Everyone came in their best tropical luxe garb and the relaxed and cheerful mood was palpable. It was a welcome break from a busy week and a great place to catch up with fellow wedding suppliers. These two beautiful ladies, inspired the very first personalized magazine-style debut invitations Printsonalities ever created. Jorgina’s debut in February 2011 and Zian’s in August the same year both featured their stunning pre-debut photos that captured them in different genres of fashion. 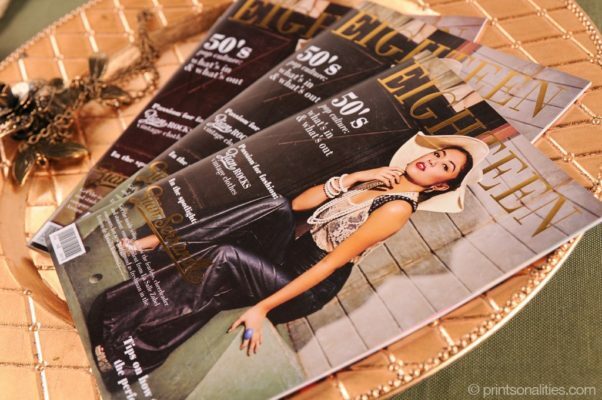 The main motivation for the two magazine-style debut invitations is that all of the glossy pages must naturally be about the debutantes. 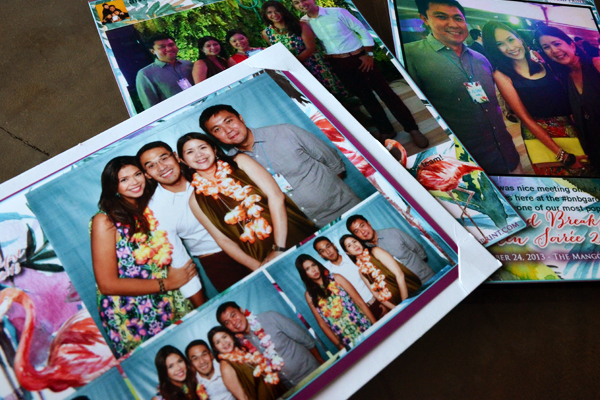 They aren’t just for inviting people but also a representation of the celebrants. 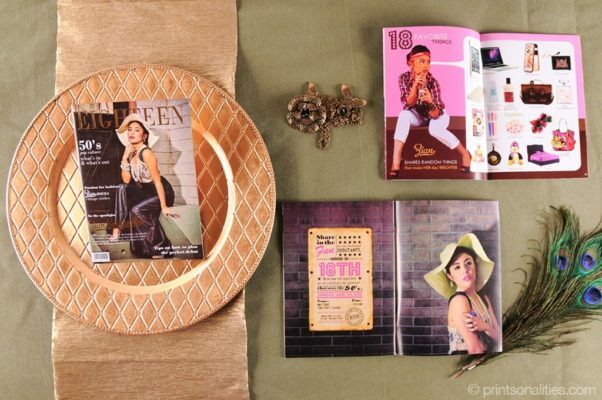 Her sweet smile and character were on display in this chic magazine-type debut invitation. Her theme for her debut was “Mod” which according to her means “being fashionable, stylish, modish, being current or prevalent, being contemporary or modern, being innovative or new, and being chic, classy or posh”. Indeed, all throughout the beautiful pages of this glossy invitation was Jorgina in her full bloom as a lady. Zian’s theme for her debut was a bit more serious and more mature. Adopting a 1950s fashion era, her fabulous wardrobe exhibition matched the vintage-inspired fonts and glossy paper stock that elegantly displayed her glamorous transition into adulthood. 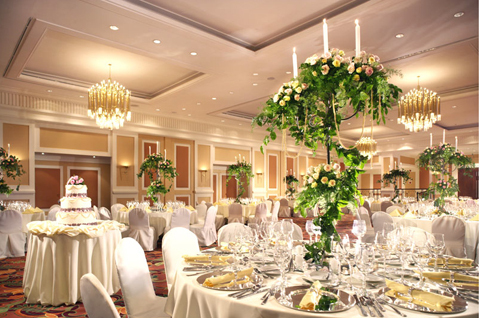 The Debut is a traditional Filipino celebration of one’s entrance into adulthood. This tradition is somewhat similar to the Quinceañera of the Latin Americas in terms of grandness and significance. This is one of the very few times in your life that the love and appreciation of your friends and family are very much felt. And, well, no other kind of invitation can fit this meaning than a full-blown magazine about you. More than the high quality customized wedding invitations and stationeries we are respected for, the debut invitations of Zian and Jorgina both show that Printsonalities can execute any concept, any design that the debutantes may be dreaming about for their celebration. Imagine being in the cover and centerfold of your own magazine. It’s like realizing your superstar dreams in the pages of a debut invitation. This was how renowned fashion designer Inno Sotto described the wedding gown he designed for Valenzuela City Councilor Shalani Soledad, who’s going to tie the knot with Pasig City Representative Roman Romulo this Sunday at the St. Benedict Church, Ayala Westgrove in Laguna. Likewise, these words perfectly describe the full classic invitation suite we crafted for the couple, which bespeaks simplicity, tradition and elegance altogether. 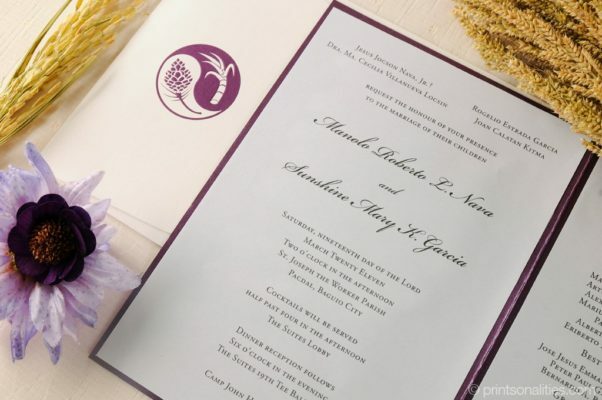 “The couple were very hands-on in the entire process of crafting their invites, and initially, what they really wanted was a very classic invitation, particularly with a monogram and a map [since they opted for an out-of-town wedding],” shared Ms. Noky Gatmaitan, client service director of Printsonalities. To fulfill the couple’s wish that their wedding be the quintessential classic, we made it a point that their wedding trousseau would be able to reflect the simplicity of the couple’s personalities, without compromising elegance that befits their distinction as distinguished public servants. As our meetings with them progressed, more elements have been added, and the whole concept led us to have one of the best classic wedding invitations we’ve done to date. The overall wedding stationery set ordered from us by the couple was composed of a layered and folded main invite in letterpress, bridal entourage, an RSVP card, a missalette, a wedding favor card, an invitation to a pre-wedding party, two thank-you cards, a menu card, table names, IDs for their wedding suppliers, and gift tags. All these components followed the same soft design that excellently reflected the personality of Shalani, known to the public as a demure, conservative and traditional Filipina. 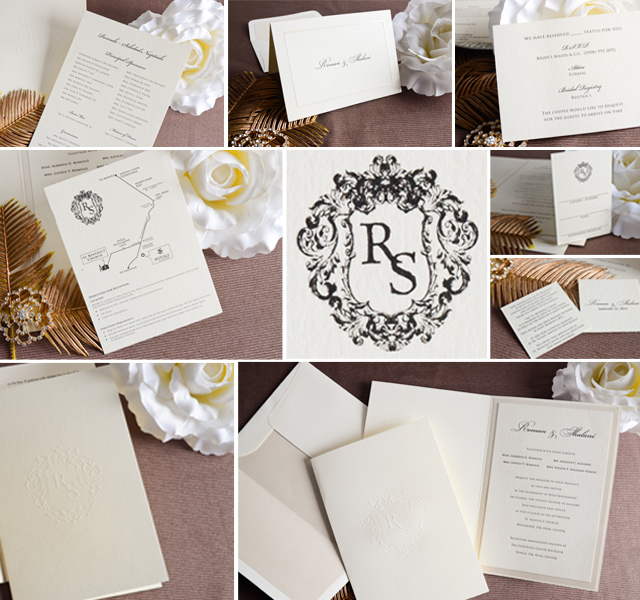 More than the all-premium ecru paper, double envelopes, embossed borders, black fonts, letterpress printing, and folded orientation that make up this elegant set of wedding stationeries, what we’ve rigorously worked on was the customized crest and monogram for Cong. Roman and Shalani. “A series of sketches and revisions have been done to provide them with a crest and a monogram, something like a clan’s coat of arms, that would serve as the seal of their love and commitment to each other. RR and SS [Roman Romulo and Shalani Soledad], so that’s why the monogram is RS,” said Ms. Noky. 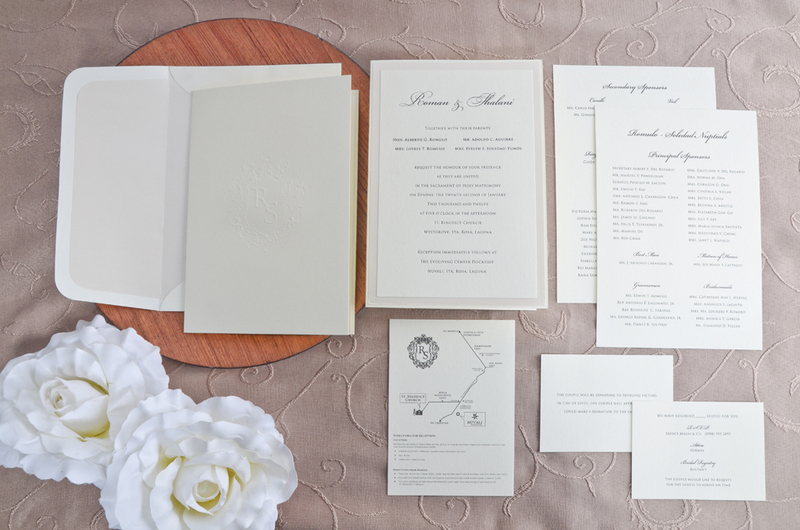 Printsonalities sees the couple’s wedding invitation suite as a perfect example of a complete classic wedding invitation. 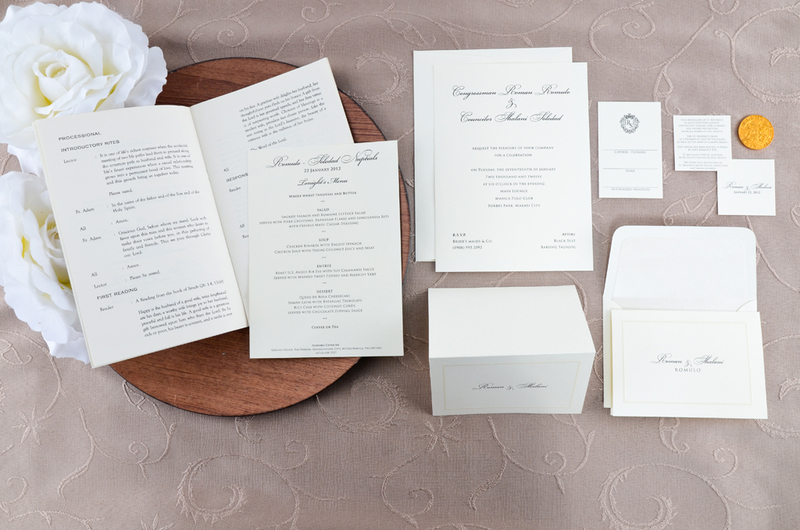 The minimalist design, veering away from vibrant colors and flashy patterns, was consistent in all stationery, bringing to life a traditional classic wedding invitation package suitable for weddings worthy of note. Designs like this, according to Ms. Noky, will never go out of style and would always be loved and sought after. Classic is here to stay. 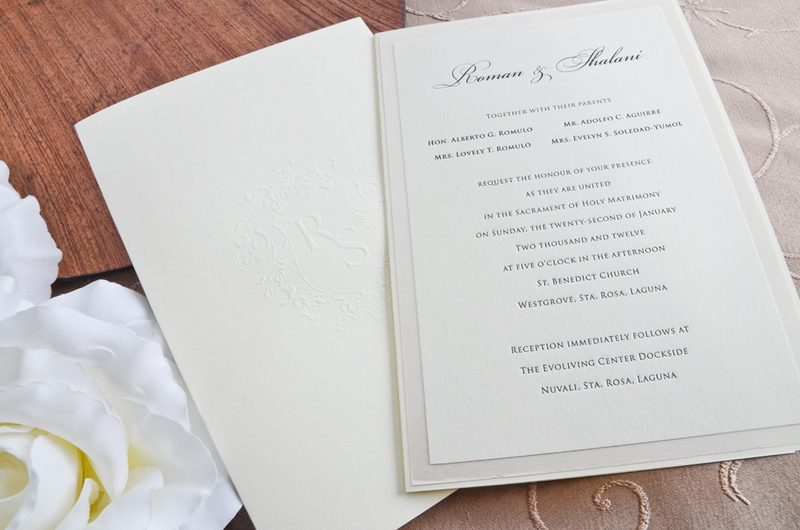 Clean, minimalist layout, stark texts, simple embossed borders, layers of premium paper, personalized monograms. Who wouldn’t be inspired to adopt the same class, taste and sophistication? 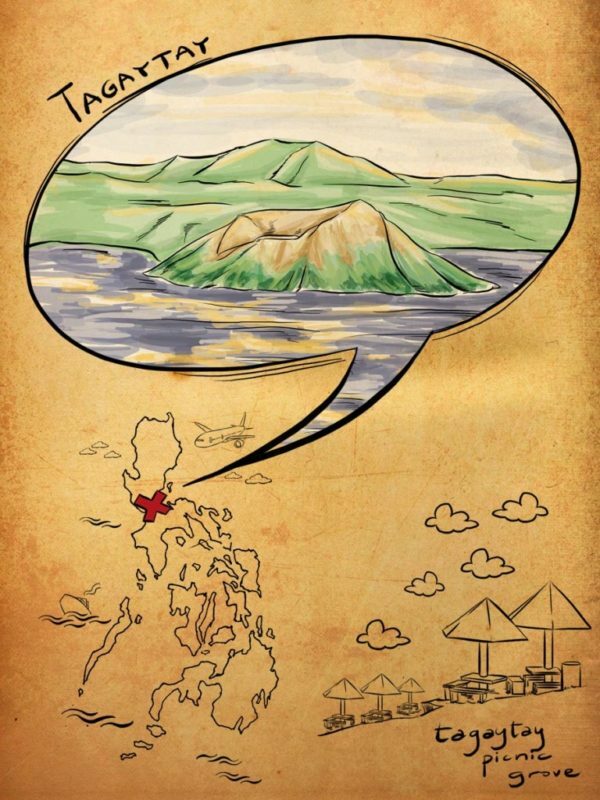 Tagaytay is one of those great cities you would want to go to for a real escape. It’s a perfect destination for quick and spontaneous getaways when you’re stressed out from metropolitan city life–the hustle and bustle of urban streets, the daily rush in the walkways, and the heavy traffic and unbearable pollution. This city in the province of Cavite, nestled on the cradles of Taal Lake and Taal Volcano, is arguably one of the most popular tourist destinations in the Philippines. Foreign and local tourists alike can relax over freshly brewed native-grown coffee while relishing the beautiful view of Taal Volcano, all just within a 2 to 3-hour drive from Manila, the Philippine capital. It is a dreamland blessed with a romantic ambiance well suited for intimate gatherings, first dates, honeymoons or even weekend retreats with the whole family. With its cool climate, a breathtaking landscape, enjoyable leisure activities and fancy food stops. Tagaytay is definitely a city worth visiting over and over again. 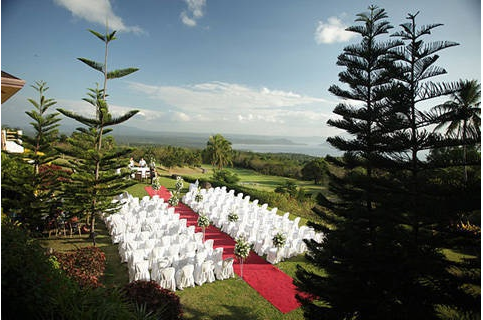 The charm and romantic mood that Tagaytay City offers has brought about its reputation as one of the best destinations for church weddings and garden weddings. 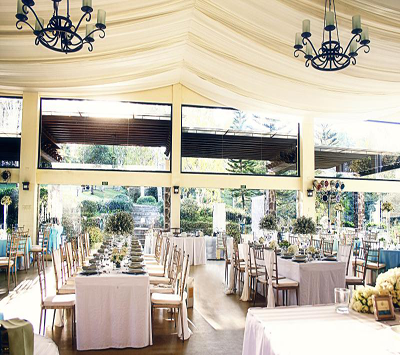 Through the years, Tagaytay has become a favorite wedding venue of Filipino celebrities and influential personalities with the picturesque churches and chapels and a long directory of enchanting garden hotels and restaurants with a stunning view of Taal Volcano. 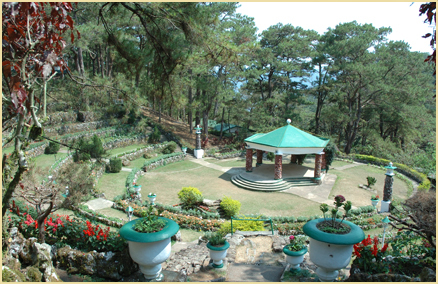 Below are the most preferred churches in Tagaytay City and in its nearby towns. 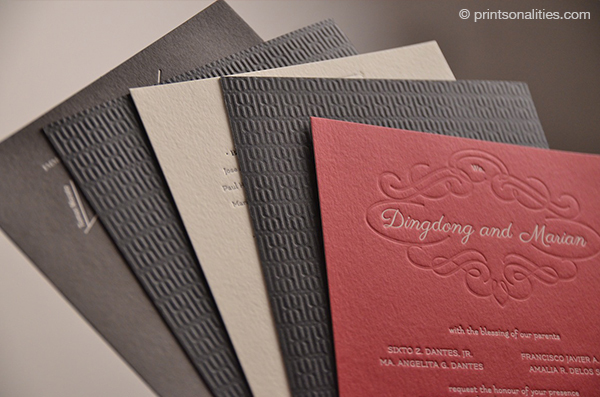 Take a look at these wedding invitations we’ve done for two Tagaytay church weddings. Both wedding ceremonies took place in Our Lady of Lourdes Parish Church followed by a reception at Ville Sommet. 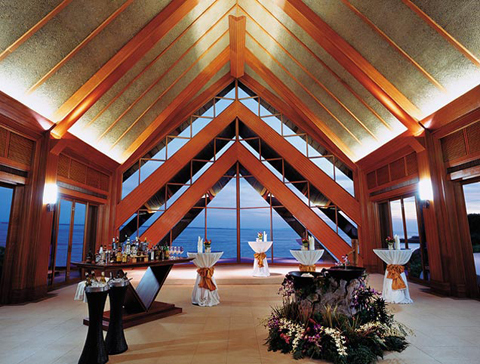 A wedding that exudes the elegance of the occasion while emphasizing a Filipino wedding with its bordering abaca layer. 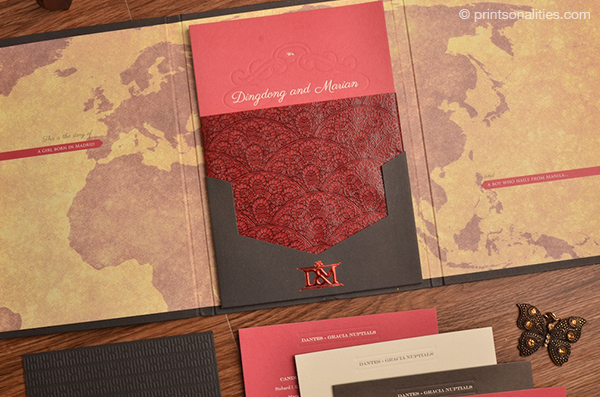 Included in this invitation set is a map of their Tagaytay wedding venues. 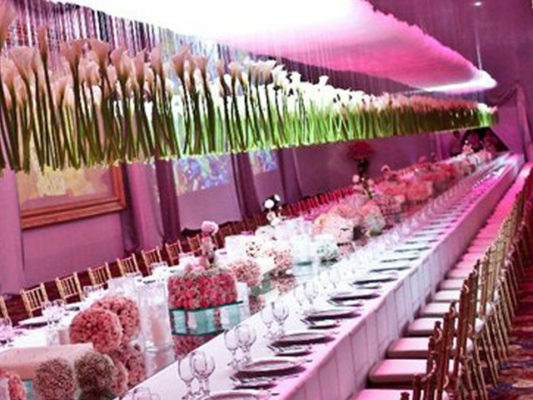 The invitation of Arwind and Ivette in 2011 perfectly captures a garden wedding reception in Ville Sommet. 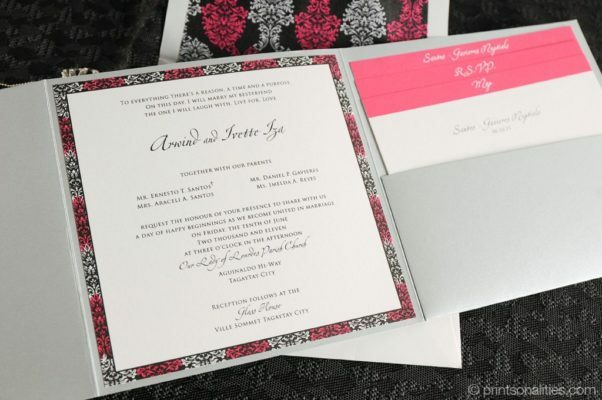 It was an elegant pocket fold invitation in silver with pink and white floral and damask patterns beautifying the set. Whether you’re having an afternoon garden wedding or an evening dinner reception, be mesmerized by the beauty and feel of these wedding reception venues our soon-to-weds prefer the most. 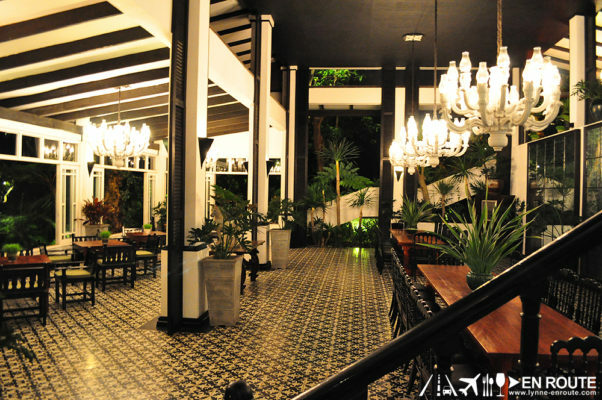 Experience the cool Tagaytay breeze, enchanting yellow lights and unique architectural and interior designs of these quaint establishments in Tagaytay City and adjacent towns. 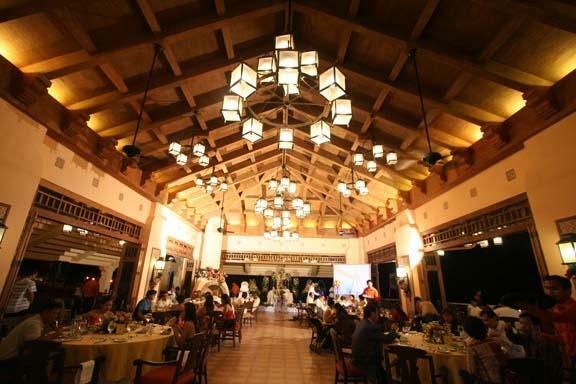 Another well-loved wedding destination in the Visayas region is the province of Cebu. Made up of a long, narrow main island and 167 surrounding islands and islets. It boasts of serene lines of pristine beaches and greening nature parks, apart from the metropolitan cities of Cebu and Mandaue. Its stunning Roman Catholic churches are one reason why Cebu is a favorite wedding destination in the country. Churches here appeal to all tastes, from historic to contemporary. These sites envelope you with a feel of a genuine Filipino celebration; topped off with the notable hospitality of Cebuanos, these churches lets you experience the essence of a Philippine wedding, much more, a Cebu wedding. 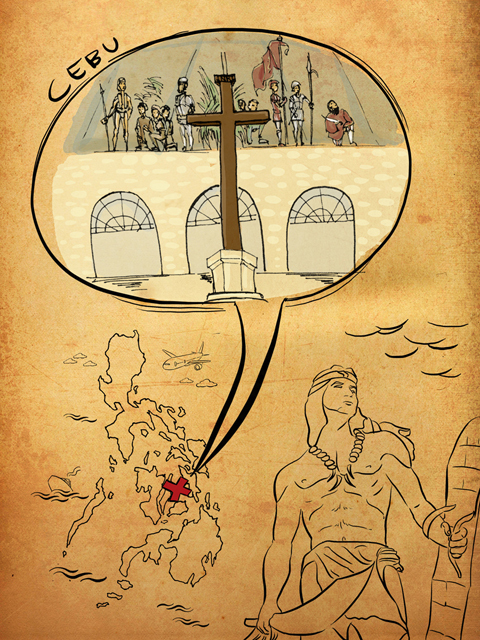 Some of the most popular churches in Cebu City include the Basilica Minore del Sto. Niño, Archbishop’s Chapel, Our Lady of the Sacred Heart, Redemptorist Church, St. Therese Parish Church, Cebu Metropolitan Cathedral and Sacred Heart Parish. 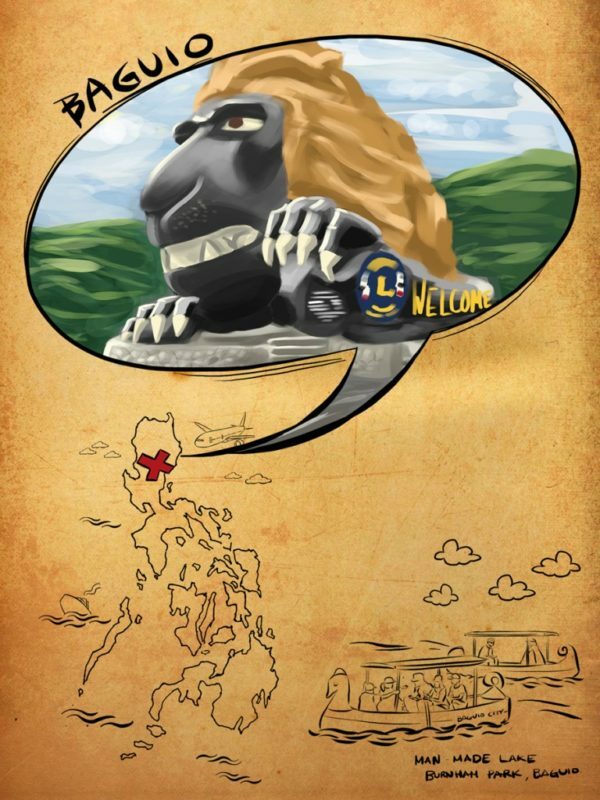 Up to this day, this hospitality and fidelity to tradition are signature characteristics of the progressive province of Cebu and is upheld by the Cebuano prime movers, dignitaries and ordinary individuals alike. 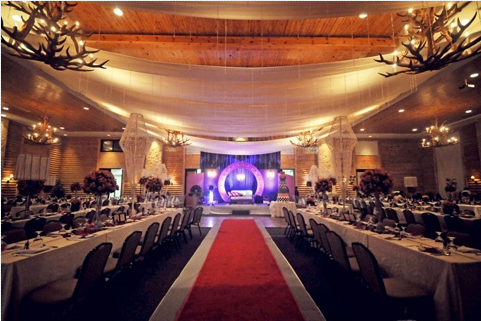 Let’s take a look at these remarkable weddings that took place in the beautiful Queen City of the South. Chris and Carla’s wedding, considered as Cebu’s wedding of the year, took place in the Cebu Metropolitan Cathedral followed by a reception at the Waterfront Cebu City Hotel. Whether you’re planning for a Cebu church wedding or a Cebu beach wedding, or even just planning to visit just to experience its spellbinding charm, remember to allot time to visit the many places around the province to truly make the best of your stay. Enjoy the wonderful sights and relish the best delectable local dishes. And if time permits, find the best Cebu lechon (roasted pig) to take home to your family and friends!